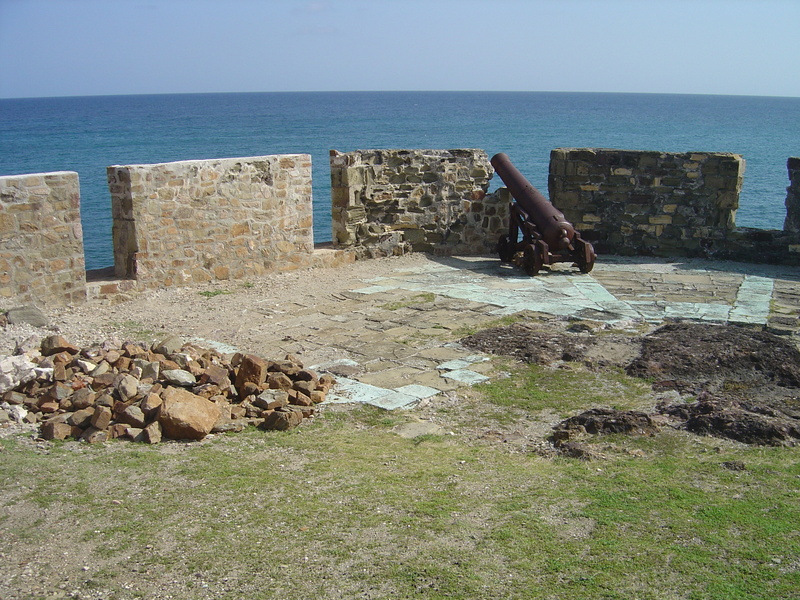 Antigua’s defences were built in the 17th and 18th centuries so that the occupying power, England, could defend the island against attempts to displace them by rival European powers, principally the French from bases in St Kitts and Guadeloupe. Later the Dutch were also rivals for territory in the Caribbean. Antigua had very attractive harbours. From the naval dockyard that now bears his name, Horatio Nelson played a part in defending the island from invasion and enforcing the Navigation Acts, which prevented ships of other nationalities trading with British-ruled colonies. 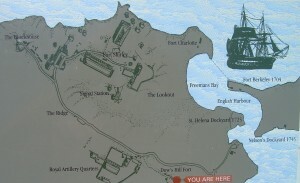 Fort Berkeley guards the entrance to English Harbour. A barricade could be put across to Fort Charlotte: see plan below. 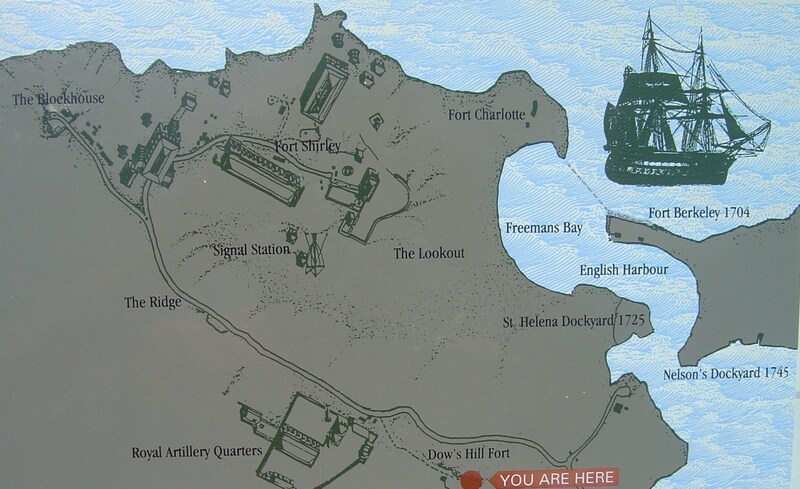 Between 1672 and 1800 at least 40 forts and batteries were constructed to defend the island, one of the earliest being Fort St James which guarded the entrance to St John’s harbour. 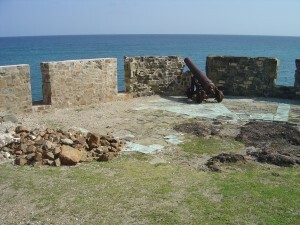 One historian wrote that “Antigua had a greater number of old fortifications in proportion to its size than possibly any other place in the world.” Threats to British rule were diminished after the Treaty of Utrecht in 1713 settled differences with the Dutch. The Napoleonic Wars a century later reduced the threat of invasion by the French. There was, though, a continuing concern of unrest amongst slave labourers. It was to meet any such internal threat as well as to defend its shores that Antigua’s British rulers maintained a locally recruited volunteer army, the Antiguan Yeomanry. 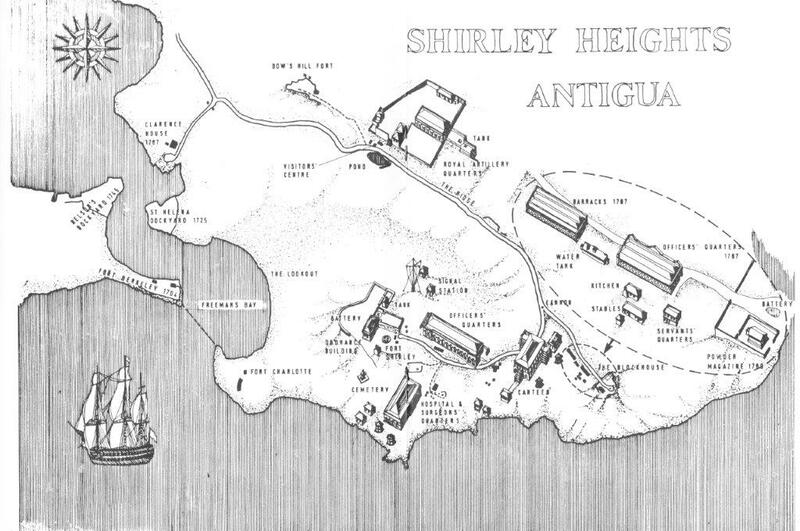 Notwithstanding occasional slave revolts, Antigua remained peaceful until the 20th Century. 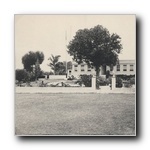 at Coolidge on the western side became an army base with a runway, the precursor for Antigua’s international airport, which unfortunately involved bulldozing the 970 acre Millar’s estate which was previously owned by Sir Oliver Nugent. 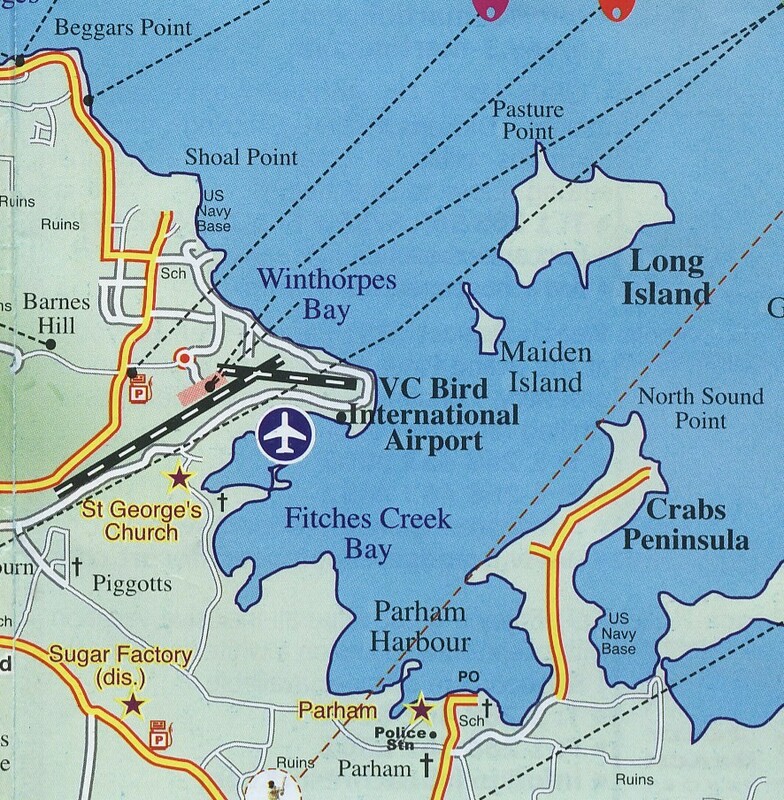 In an echo of an 18th century device for protecting English harbour (see plan), an anti-torpedo barrier was strung across the entrance to Parham harbour. A large number of American architects and construction workers arrived, followed in due course by service personnel. Contractors took over the newly constructed Antigua Beach Hotel at Hodges Bay. Anti-submarine patrols extended upto 350 miles into the Atlantic and aircraft flying from Coolidge dropped depth charges at suspected German submarines. 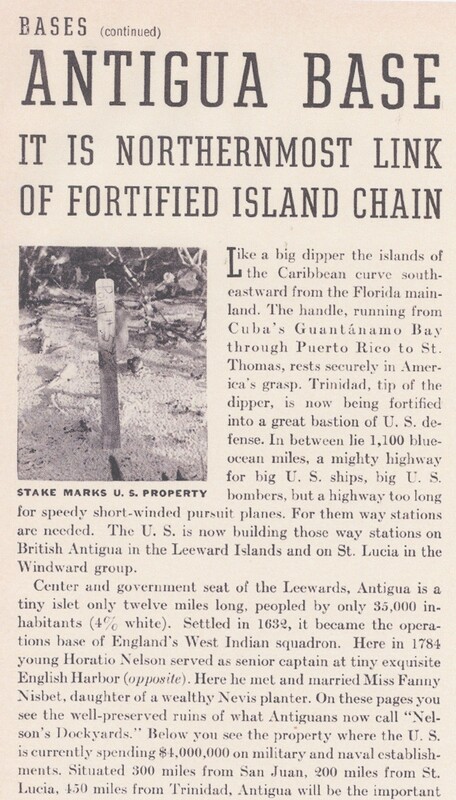 This was the start of American interest in the island and, some would say, Americanisation of the island. 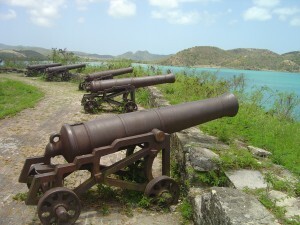 This activity and infusion of capital was good for Antigua’s depressed economy. 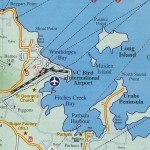 There was a jittery atmosphere on the island. 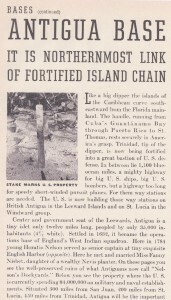 According to ‘Antigua Then’ by Margaret Lockett, Americans pressurised the British authorities to relocate several Jewish refugee families from Antigua to other islands fearing they may be spies. Older colonial inhabitants were forced to decide whether to remain on the island they regarded as home, to resettle in war-torn Britain or perhaps move to the United States. Those inclined to set sail for Britain had the added difficulty that passenger services had ceased as the risk that ships crossing the Atlantic would be attacked was high. My grandfather died shortly after war broke out. My mother, who grew up in Britain, reminds me that people did not know how long the war would last so it was difficult if not impossible to make long term plans. My newly-widowed grandmother was in that situation. For her things were complicated by the fact that her two youngest sons, Osbern and Nick, were at school in England. Her third child, Oliver- my father, started his first job as a lawyer in Bassetterre, St Kitts in late 1939. I am not sure when he made the decision to leave the Caribbean and ‘join up’, but it was some time before he was allowed to depart. One reason, according to my mother, was that he had to wait for the judges who used to visit on circuit to come and hear the cases in which my father was appearing. 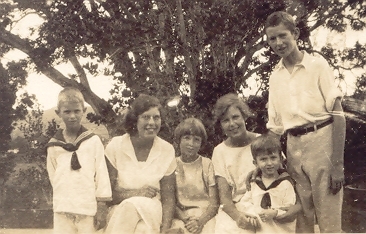 During this period he was visited by his mother in January 1940, perhaps fleeing the relative insecurity of Antigua, or perhaps saying ‘Goodbye’ before leaving the following month via Martinique to Canada, only to return to Antigua in September to rendezvous with her youngest son, Nick, then aged 14, who may have been returning from school in Britain. Together they left Antigua again, via St Kitts, for Bermuda, where she set up home for the next three years. She made at least one further visit to Antigua and to Oliver in St Kitts in August-September 1941. Eventually Grandmother sailed with Nick from Bermuda for England in February 1944. The children of George and Gladys Nugent from left: Osbern, Monica, Joyce, Peggy, Nicky and Oliver. Meanwhile, her fourth child, Joyce, who remained in Antigua when her husband, Tony Robertson, was called up by the Royal Naval to serve on a minesweeper, took her young sons Edward and Tim – just 6 weeks old – to St Kitts to “keep house for my brother, Oliver,” according to her diaries. 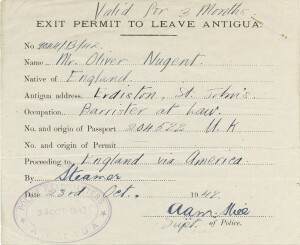 Oliver eventually got his permit to leave Antigua on 23rd October 1942, and proceeded soon afterwards to England via America. 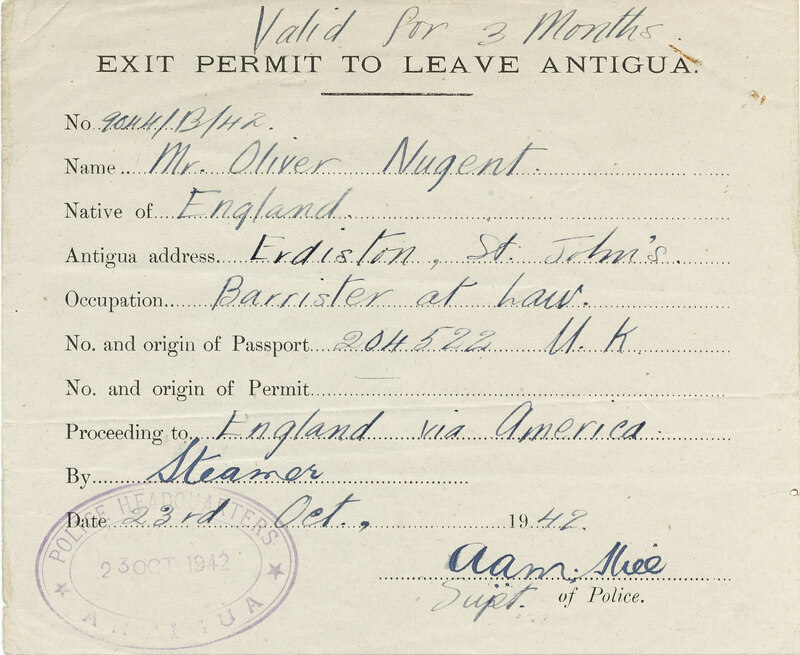 Joyce returned to what she describes as “a very different Antigua – all our young men had gone to England. The Americans had taken over, in return for 50 old warships. They had a large area on which to build their base.” Tony returned briefly to Antigua in October 1942, seeing baby Tim now aged 2 ½ for the first time, before taking up a naval assignment in the US. Joyce and their young family followed him there. Only my great grandmother, Mary, her daughter Gertrude Howell and family continued to live in Antigua through the war. Neither my grandmother, Gladys, nor any of her six children were to return after the war. Osbern was killed serving with the Polish Air Force. His plane was shot down over the Netherlands and he is buried in a war grave cemetery at Reichswald. Oliver, who served with the Royal Air Force in Ceylon and Singapore, and Joyce, settled in Britain after the war. Nick, after serving in the Indian Army, joined the police in Northern Rhodesia (now Zambia) and subsequently Nigeria. Peggy lived for many years in Malaysia and Monica lived in Uganda. All eventually returned ‘home’ to Britain where they are buried. Gladys (d 1965) and her daughters Monica (d 2008), Peggy (d 2000) and Joyce (d 1984) lie in the churchyard of St Michael’s, Aldbourne, Wiltshire.